Margo Goodhand became editor-in-chief of the Edmonton Journal on September 16, 2013. Ms. Goodhand’s first daily news job was as a reporter at The Medicine Hat News in Medicine Hat, southern Alberta. She became that paper’s first female news editor in 1986 before moving to Kelowna, B.C., to found Okanagan Business Magazine. Following the birth of their first child, she and her husband returned to Winnipeg where she ricocheted from the Winnipeg Sun to the Winnipeg Free Press three times before settling at the broadsheet in 1993. At The Free Press Goodhand worked her way up from copy editor to assistant city editor to arts editor to deputy editor to its first female editor in 2007. 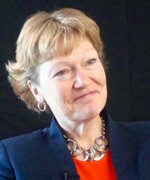 Under her leadership, the newsroom won dozens of national and international awards, including Canada’s best newsroom from the Canadian Journalism Foundation for 2009 and 2012. She took a year off in 2012 to write a book on Canada’s first women’s shelters, before coming to Edmonton. Goodhand is a distinguished Alumna of the University of Winnipeg, and a vice-chair of the National Newspaper Awards Board of Governors. Margo Goodhand, Editor, Edmonton Journal, tells the story of The Edmonton Journal.